It can be difficult to estimate the size and weight of any extinct animal such as Styracosaurus, particularly when relatively few fossils specimens have been found (as is the case with Styracosaurus). An adult Styracosaurus would have been upto 18 feet (5.5 meters) long. An adult Styracosaurus would have been upto 6 feet (1.8 meters) tall. The horn on the nose of Styracosaurus would have been about 2 feet (60 centimeters) long, and 6 inches (15 centimeters) wide at its base. 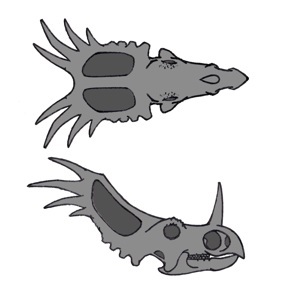 The four longest spikes on the neck frill of Styracosaurus would have been almost as long as the nose horn - perhaps about 20 to 22 inches (50 to 55 centimeters) long. An adult Styracosaurus would weighed about 3 tons.